The Perth-based ISP has brought out a series of sim-only mobile voice plans. iiNet mobile voice plans for business customers. Perth-based ISP, iiNet, has forayed into the mobile voice service space. It has released a set of residential and business sim card-only plans starting at $10 per month with no lock-in contract. The service includes calls as well as Internet data and un-metered access to social networking sites such as Facebook and Twitter. To combat “bill shock” iiNet has put a system in place to notify customers when call usage has been exceeded. A $10 monthly residential plan gives users $150 worth of call credit and 200MB of data. 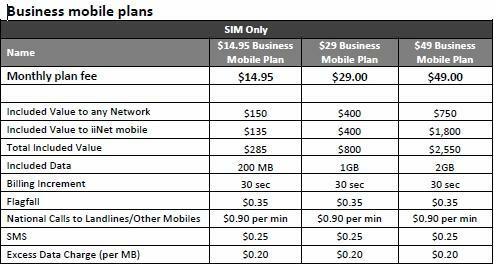 The $20 plan includes $400 worth of calls with 500MB while the $40 plan has a $750 call value and 1.5GB data allowance. Details on business plans are indicated in the table at the beginning of this article. Call costs across the plans are $0.90 per minute with $0.35 flag fall. Mobile services can be put on the same bill as other iiNet services. iiNet already offers broadband, fixed line voice and IPTV services. Last month the ISP launched its in-house research and development (R&D) division, iiNet Labs, to focus on bringing consumer products to market. It has since introduced the BoB Lite, a compact version of iiNet’s original phone and Internet aggregate device.